Stories have the power to bond diverse groups of children, youth and adults in a true spirit of sharing and engaging. Stories build bridges between the old and young; between the oral and written worlds and between different worlds of experience. Stories talk about people, places dreams, possibilities. Through our village libraries and reading programmes children are helped to build personal connections between printed words and visuals, and their lives. The OELP village library programme, with village bahus (daughters-in-law) at the helm as librarians, has been conceptualized with the tall aim of building communities of engaged readers within low literate, rural societies. Why the Kahani Melas ? They engage children and their communities through sharing and celebrating stories and books. Unheard and unseen stories, whether documented or not are an important part of these celebrations. Stories have also catalyzed a coming together of teams from different languages and cultures; from as far as Delhi and Gujarat and connecting them with the children and communities in rural Rajasthan through the universal language of stories, while remaining unmindful of the scorching heat and parched landscape. About 5000 children, youth and adults have been involved in various ways. 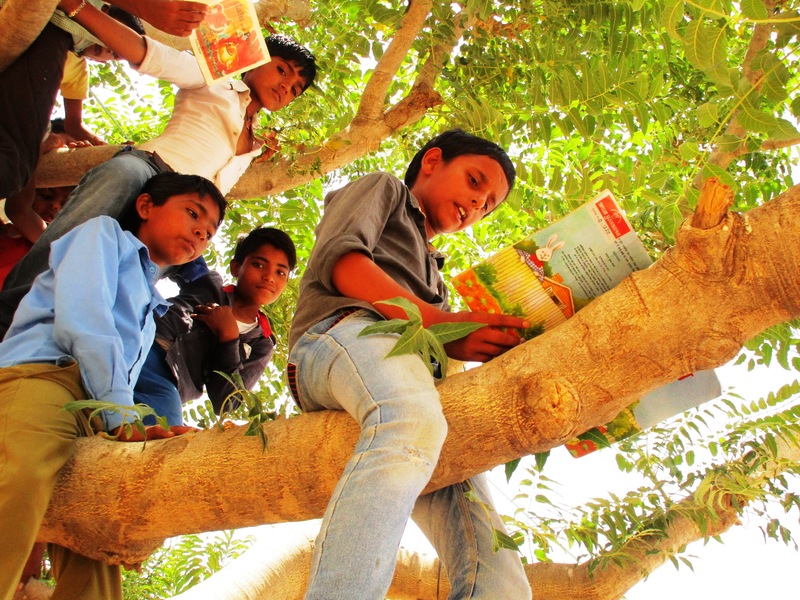 In eleven villages located in the Kishangarh Block of Ajmer District hundreds of children have been reading, presenting and creating stories in a variety of ways. They have also connected with older people to discover local stories and other knowledge forms along with various aspects of their socio-cultural heritage. They have shared their discoveries through charts, village maps, story mobiles, story boards, puppets, books created by them, along with visual art forms and performances based on stories and storybooks. Our aim is to create a platform for rural communities to develop deeper connection with stories and books, and to encourage them to actively engage with their children’s processes of self actualization and learning. Our challenge has been to build communities of readers and writers within low literate societies that are entrenched in oral traditions. Through this slow and gradual journey, stories have emerged as a vital element in this process. The entire cost and organization of the three Kahani Melas events and some of the costs of the preparatory processes that led up to them over two weeks were borne by the village communities and local Pachayats, The Sarpanches from Kalyanipura and Patan Gram Panchayats took on leadership roles in catalyzing village communities and offering wholehearted support, i.e. fund raising and organizing food for 300-400 children at each Mela. Villagers opened up their homes and hearts to the volunteers. Different village homes organized lunch for the volunteers each day. The response from the village communities has been overwhelming. We view this as the start of new journey and a process that we will try to continue in organic ways. This ongoing effort, spanning few months before the melas, received support from the American India Foundation. OELP’s intensive efforts found depth and enthused energy under the leadership of Jaya Iyer. It led to the coming together of an enthusiastic and committed group of volunteers and resource persons from Delhi. Bal Mitras from AKRSPI Gujarat also engaged with commitment in the final preparations. Each team was headed by one or two people with further subgroups within each of these heads. Tasks were listed and detailed out for each team, and specific roles and responsibilities spelt out. Volunteers from Delhi, Bal Mitras from AKRSPI Gujarat and OELP team members supported the pre event processes at the village level in small groups. They received a warm welcome from the communities. What made these Kahani Melas special? Each Mela is a culmination and part of larger, longer process of engagement with children on relevant themes and not a stand-alone event. Each mela is for children, a fun event yet with depth and meaning and themes which are woven into every strand. These themes inform all the activities, design and spirit of the mela and not separated as – content section, which are serious and fun activities, which are frivolous. Each mela is also by children – an attempt to involve children as partners/ co- creators to the event and not as mere passive recipient or spectators. These melas are learning-oriented – for everybody involved – young and old, rural and urban; it is a space for learning and enhancing selves for the volunteers – many of whom were from Delhi; for colleagues from Gujarat; for teachers and members of the local communities; for Education Department officials; for visitors from other organisations and for the OELP team. Feedback and follow up workshops continued after the event to ensure continuity and connection. The overall feedback from students, teachers, resource persons and OELP staff was very positive and showed the way for future direction and activities. Nallu in this village the OELP team had made a conscious effort to include children from almost all the mohallas , like the Lohars; Mali; Kumar; Jat and Regar mohalla. About 20 to 25 children were participating regularly from the Regar mohalla. However about 6 days before the mela there was a wedding in a Regar family and the bridegroom was killed in an accident in Kishengarh, so none of the children from the Regar mohallah participated. These are challenges that working in th field has to constantly deal with. In the same village, two days before the Kahani Mela the school was handed over to a family from the Mali community for a wedding and the OELP teacher was asked to clear out her classroom. She panicked as they has work to complete. She decided to take all her children home. However there was not enough space. She then phoned the school principal and shared the situation with him. He did not hesitate for a moment. He came to Nalu and opened up a room in the secondary school for the children to continue their preparations. One day before the mela a close family member of the teacher was killed in an accident. She had to leave immediately for her paternal village; however she knew that parents would send their children to the Kahani Mela only if she accompanied them. So she decided to stay back and accompany the children to the Kahani Mela the next day, even though she had to face the wrath of her kith and kin. Relavata – A huge and successful effort was made by the OELP teacher to include children from the Kalbelia community, which is a marginalized community. However, the Bagriya community, which remains as another ostracized social group refused to let their children participate. This is a challenge that we will continue to work on in the near future. Paner- is an interior village. A huge effort was made in this village to include all communities, and the OELP team was successful in including quite a few children from the Kalbelia community. What was disappointing however was that despite concerted effort girls were not sent to participate in the Kahani Mela, and in the end it was only a group of boys who participated. “ Before going to Chundari for volunteering, it was told to us that a child had died in some accident at a farm. The entire village mourned and no one cooked for two days. This experience was different for me as it taught me that the village does not have several different homes rather the village is a big family in its own way. They not only share happiness but sadness too. Going to Chundari made me feel a part of a huge family, who never made me feel homesick. This later became an issue which was debated within the team- whether the dance was more important than the self respect of individuals from a lower caste group and whether what they had done was the correct things to do? The Rajputs, including the women were however not able to give the story, pointing to the rapidly disappearing oral cultural heritage, and the need to sensitise children towards it. It was the wife of Ramu ji Bhand’s who finally shared the story of Ghumar. Ramu ji is no longer alive. The Bhands are the local minstrels. We need to improve our communication skills especially on the social media so that more voices from the field get heard. I came to Kahani Mela with very little information about the project. 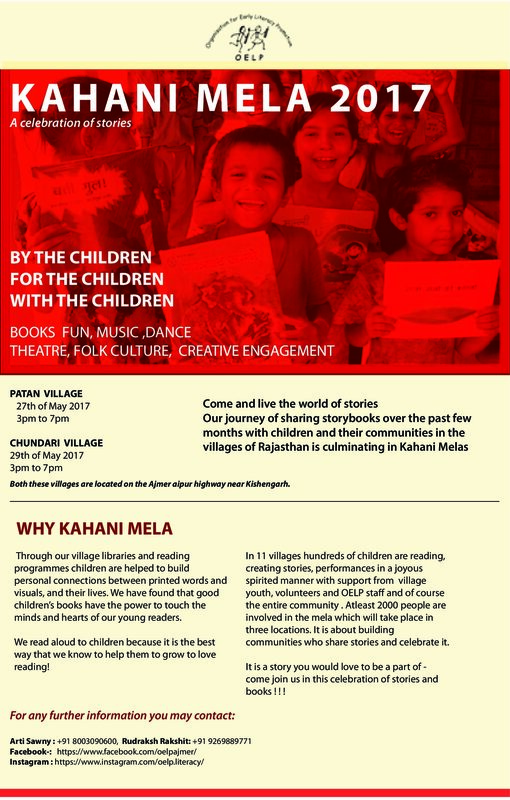 I was attracted by the aspect of ‘Kahani’ and thought that we would visit schools and do storytelling with students. But after reaching Ajmer and having our orientation, I was left even more excited as not only were we telling stories but we were going to facilitate students in developing their own stories, plays, puppet shows as well. I worked with different students and I was amazed to see the talented children in the village of Kalyanipura. I played various games with them, formed stories from a few words, did community walks and many other things. Working with the kids was something I was really looking forward to and OELP gave me an amazing opportunity to do it here. Organizing the Mela itself after all the preparations was fun too. Even though it became a bit stressful sometimes due to workload and hot weather, it was exciting and encouraging to see everyone working together as a team to bring the event to life. When I talk about working with community, it was really interesting to see how receptive and welcoming the community and village people were to our presence. They took us into their homes, gave us food and water, and talked to us even though we did not share a common language. This was really special to me as I realized that you do not always need a language to communicate, just love, affection and the will to communicate our feelings is enough. I gave my best to involve community people in the Mela as I took part in rallies, lead a rally myself, visited people’s homes, met the Sarpanch of the village who is a very strong women and a role model for young girls, and invited them all to the event. Also, I tried to involve the youth as much as possible by delegating them responsibilities so that they can become more confident and develop leadership qualities. Few things that impacted me the most was the love given to us by the community. On the first day in the village, we were supposed to have our dinner in the village too, and then leave for our head office where we were staying. But when we got very late after dinner, the people offered us to stay in their home. It was really special, as I have never seen such love and trust between people in Delhi. They offered us to stay even though we were strangers to them. Another incident that I found interesting was how excited the children were to read the storybooks from “Kahaniyon ka khazana” in the Kalyanipura Mela. Usually, we see that the teachers blame the students that they do not want to read due to their unwillingness, no interest towards reading and even their low socio-economic background. But here, it was seen that students were clearly interested and enthusiastic to read, they just need proper guidance, facilitation, and encouragement to read. Also, the women and senior citizens of the village community took part in Mela and appreciated it. I think that parents’ own interest and support towards child literacy will help a lot in developing more literate and sensitive citizens. Some things I liked the most was that the teachers in the school were making efforts to include children in various activities and tasks for the event. They were using different methods and styles to make the tasks more interesting. The teachers were trying to use students’ experiences as learning resources and also giving them the opportunity to explore more about themselves, the village they live in and the local village stories which were collected from the elderly of the village in the form of ‘Gaon ka Itihas’, ‘Gaon ki lok kathayien’ and many more collections. Rather than using traditional approach, teachers were using different pedagogy methods to include children in different activities. The challenge I faced during working here was that only few students were selected and being repeated in different plays. Other students did not get equal opportunity to take part in stage performances. When we tried to change it, the students refused to come to school stating that they had worked on the play for 15 days. Due to lack of time, we could not prepare new plays or change the actors in the current plays may be this was because some students did not take part in the process initially due to hesitation and low motivation So, I think that the teachers should motivate to all students rather than few selected ones. Another reality and the most important one that really disturbed me was that when I visited the community and interacted with people, I realized that there are lots of child marriages still taking place in the village It really affected me deeply as these children are so young and their childhood is being snatched away from them due to this social evil. Overall, my experience in OELP was very enriching and the whole journey was beautiful. I would love to volunteer again for OELP and have more such experiences again.